I have been slow posting on here recently and a big reason for that is work–I’m traveling a lot more these days. I recently came back from Mexico City where you can find a street vendor, any time of the day or night, selling refreshing tamarindo drink. In fact, tamarind seemed to be in everything from treats sold in the middle of the night under florescent lights and swinging fly catchers to the rarified dishes of some of Mexico City’s most famous restaurants. By the end of my trip, I was a full convert to the sweet and sour fruit. Stateside, to satisfy my new-found love of tamarind for the last week or two I have been buying tamarindo drink from the street vendors in my neighborhood–but that has been getting expensive. This past week, I was going on one of my many long walks in the neighborhood when I came upon a bodega with a giant basket of the pods out front–I gleefully filled a bag with them. In my enthusiasm, I may have bought too many–thankfully they last a long time stored at room temperature. While I plan on making a variety of recipes with the pods, the first one my list is a curry. My version of the dish is versatile, doesn’t require too much stove time in this weather and has a little bit of a kick. This curry is spicy, a little sweet and a little tart–perfect for a hot day like today. 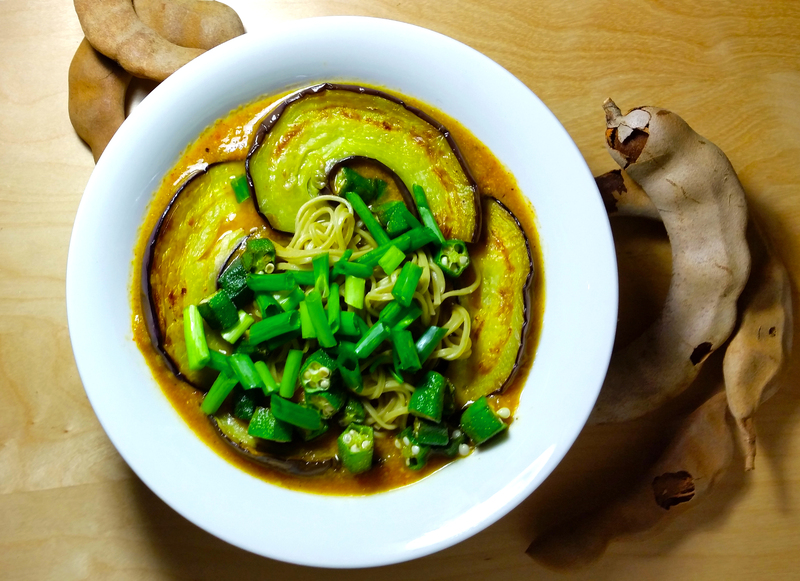 You can add any of your favorite vegetables to the curry once it is done–I’ve made mine with grilled Japanese eggplant, sauteed okra, scallions and some soba–but get creative and add whatever veggies you are feeling into today! If you don’t have a bodega like mine in your neighborhood you should be able to find the pods in most grocery stores that have a decent Asian, Latin American or Indian food section. Remove the fruit from the tamarind pods and place it into a bowl. Cover with warm water. Meanwhile add the garlic and onion to a food processor and pulse until it forms a paste. Add the olive oil to a large saucepan, pour in the onion-garlic paste and cook over medium-high heat for 5 minutes, stirring occasionally. Add the ginger, tomato, turmeric, chili powder, sugar and garam masala to the food processor and pulse until it forms a smooth paste. Add the tomato mixture to the onion mixture in the pot and cook for 3 minutes, stirring occasionally. Massage the tamarind fruit until it dissolves into the water and is removed from the seeds (it will look like tamarind juice). Strain the liquid into the pot to prevent any seeds or stringy bits from getting into your curry. Add in the light coconut milk. Bring the mixture to a simmer and cook until the liquid has reduced and the curry has a thick consistency, approximately 10 minutes. Remove the pot from the heat and add in the curry leaves and let the mixture stand, uncovered, for 3 minutes. Add your favorite vegetables and grains to the curry and enjoy any way you like! Serves 4. This entry was posted in Mains and tagged coconut, curry, dinner, eggplant, gluten-free, green tea soba, soy-free, tamarind, vegan, vegetarian. Bookmark the permalink. I first learned to love tamarind when visiting Caribbean islands, where I had it in sweet treats sold on the beach. This looks delicious!